Photo by Scott Reagle Chautauqua Lake’s Lily Woodis (33) makes a pass during Friday’s CCAA Division 1 West girls basketball game against Maple Grove in Bemus Point. BEMUS POINT — A hot start allowed Maple Grove to take an 11-0 lead before Chautauqua Lake even made a field goal. Then the Red Dragons put the game away late at the foul line. 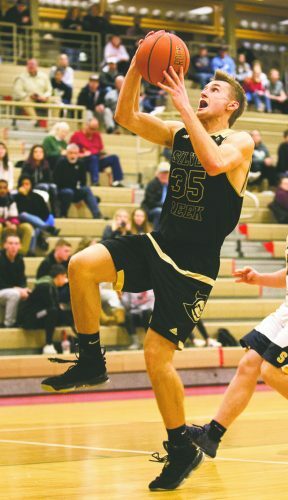 Maple Grove made its first five shots from the field to open the game and went 9 of 10 from the free throw line down the stretch in a 57-48 Chautauqua-Cattaraugus Athletic Association Division 1 West victory Friday evening. Courtney Hemminger led the Red Dragons (14-3, 6-3) with 16 points to go along with three steals while Bre Hill had 12 points and 16 rebounds. Marisa Schuppenhauer chipped in 11 points, six assists, five rebounds and four steals. Maple Grove played with more energy in the first half, jumping out to a 19-6 lead after the first quarter and a 34-16 halftime advantage. The Thunderbirds shot just 5 for 24 from the field and turned the ball over seven times in the opening 16 minutes. 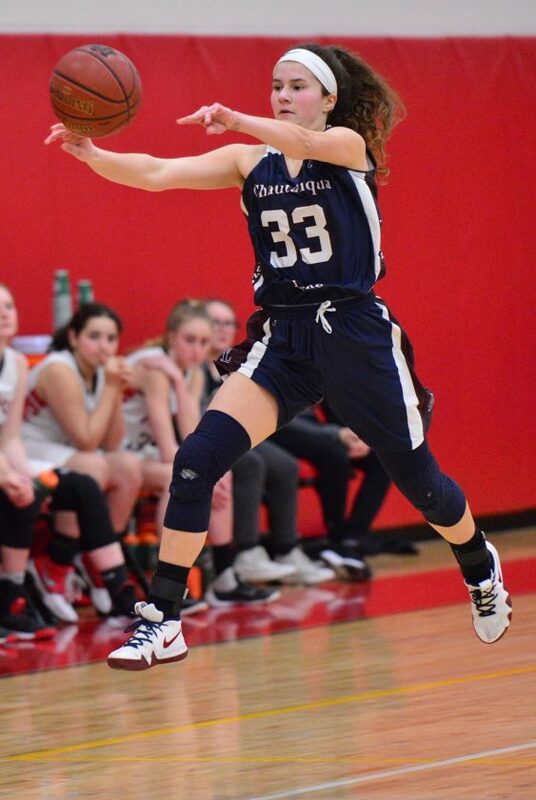 Chautauqua Lake (10-8, 3-6) made a game of it after halftime, mainly due to Lily Woodis. The freshman poured in 18 of her game-high 24 minutes in the final 16 minutes, including 11 in the third quarter. Woodis made a free throw on the Thunderbirds’ first possession of the third before Emily Phelps fed Abbie Henry for a three-point play with 6:36 remaining. Woodis then drilled her first 3-pointer of the game to make it an 11-point game. A pair of Katelyn Fardink free throws were followed by another Woodis 3-pointer before Kyleigh Perdue made it a 34-30 game with a pair of free throws. 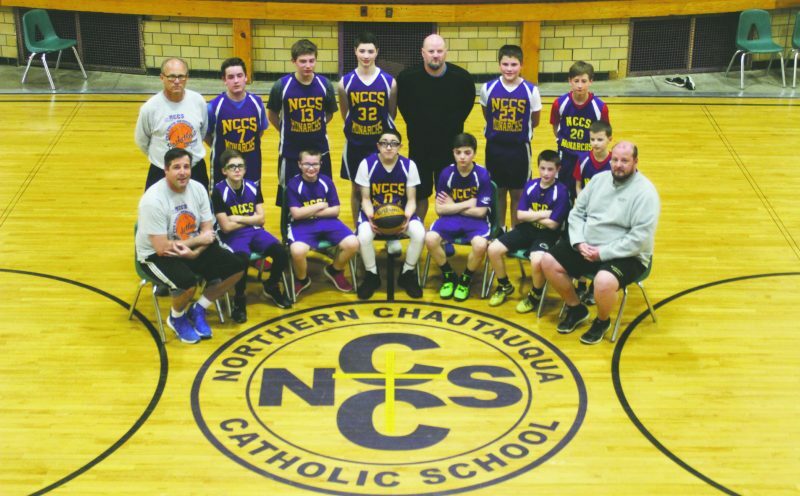 Sam Snow finally made the Red Dragons’ first bucket of the third quarter with 3:01 remaining, but Woodis made another basket after another Fardink free throw to pull Chautauqua Lake within three with 58 seconds left. Hemminger and Woodis traded baskets with under a minute to go, and it looked like it might be a one-possession game heading to the fourth quarter, but the Red Dragons rebounded their own missed free throw and Snow hit a 3-pointer with seven seconds left in the quarter to make it 41-35. Woodis’ final 3-pointer of the night pulled Chautauqua Lake within four with 4:07 remaining, but Maple Grove rebounded three of its own misses and Snow scored with 2:30 left to give her team a six-point lead. The Thunderbirds’ Lauren Alfa made a basket with 59 seconds remaining to make it 48-43, but Anna Tranum, Schuppenhauer and Hemminger combined for nine free throws with under a minute left to put the game away. NOTES: Lexi Jacobson had nine rebounds, five assists and five steals; Woodis had eight rebounds, three steals and two blocked shots; and Abbie Henry had seven rebounds for Chautauqua Lake. … Maple Grove was 21 of 64 from the field, including 4 of 11 from 3-point range, while turning the ball over 14 times. … The Thunderbirds were 14 of 52, including 4 of 23 from 3-point range, and turned the ball over 12 times. … Hemminger and Woodis were named Cross Training Athletics/Intense Milk Character Athletes of the Game. … Megan Fischer scored 19 points and Brinn Marjoulis added 17 as Chautauqua Lake won the jayvee game, 53-41.